The House Human Services Committee passed the bill out of its committee Feb. 7 after only making what Vermont Right to Life called “cosmetic changes.” It now moves to the House Judiciary Committee. 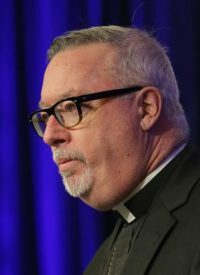 Bishop Coyne said the Catholic faith teaches that all human life is sacred, “meaning ‘of God'” — from the moment of conception to the moment of natural death and that Catholics are called to embrace and protect that sacred gift. This is not exclusively a Catholic issue as evidenced by the scores of non-Catholics who joined pro-life Catholics at the Statehouse for a Feb. 6 hearing. He is executive director of evangelization, catechesis, divine worship, marriage and family and respect life for the Diocese of Burlington. Across the country, the New Mexico House Feb. 7 passed a bill pro-life leaders say will allow abortion on demand for any reason. The measure also takes away a parental notification requirement for minors and removes conscience protections. It now moves to the state Senate, and if it passes will go to Gov. Michelle Lujan Grisham to sign into law. She has made it clear she will do so. Urban is content editor/staff reporter for Vermont Catholic, publication of the Diocese of Burlington.